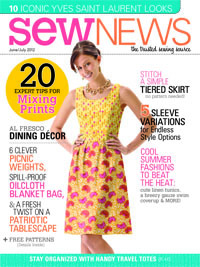 In case you haven’t seen it yet, I wanted to call your attention to the current issue (June/July 2012) of Sew News, which features Lisette on the cover. Since fashion these days is all about prints–and especially mixing prints–I wrote a little piece for the magazine about successfully combining prints in your own sewing. In the article I provide some tips for mixing and matching prints in ways that will work for everyone, even if you’ve never tried this look. I hope it will help you to combine printed fabrics in ways that are fun and unique to you and your own tastes. We had fun with the photos for the piece. To illustrate the suggestions I give, I was able to put together several different print combinations for the same pattern, the Lisette Passport Dress and Jacket, to show how print selections can really change the character of a single style. 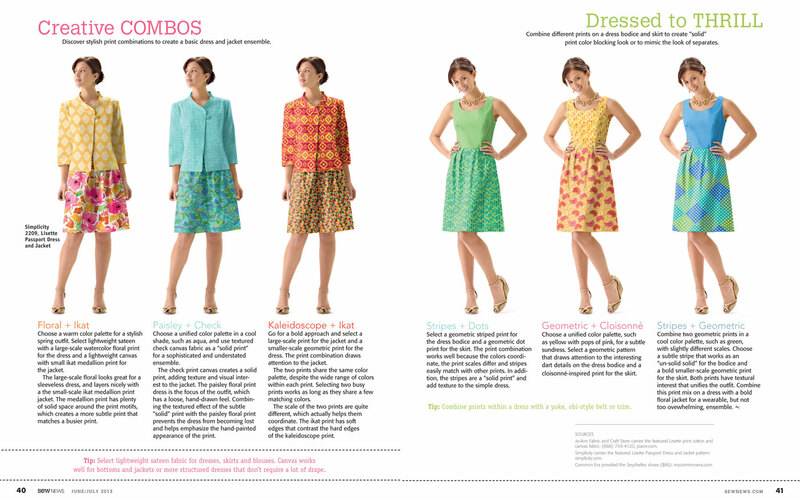 Sew News has generously provided the article as a free PDF on their website. Hop over there to download your copy. And then start mixing some prints!